Brownies are my very favorite sweet treat. I bake them all the time. So naturally I had to try these Lunch Lady Brownies that I saw all over Pinterest. Because what’s the only thing better than a brownie? A brownie with frosting. And these brownies are covered in a wonderful chocolate icing. 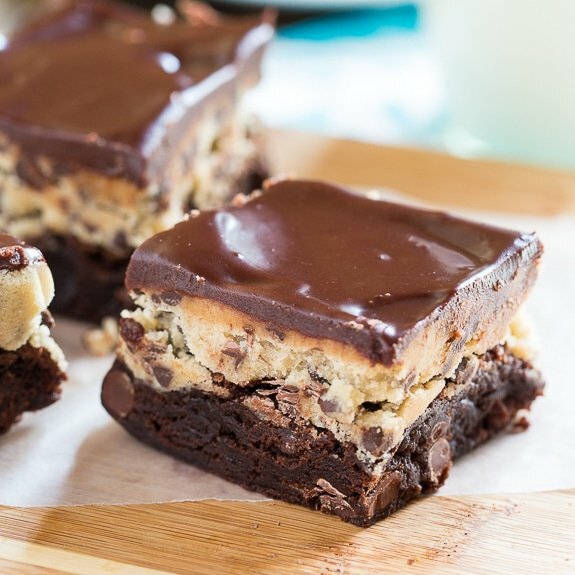 These are my very favorite kind of brownie- fudgy, chewy, and oh so chocolaty. You’ll have a hard time not eating 2 or 3 or even 4 or 5. They are that good. It’s a classic recipe you will want to make over and over again. 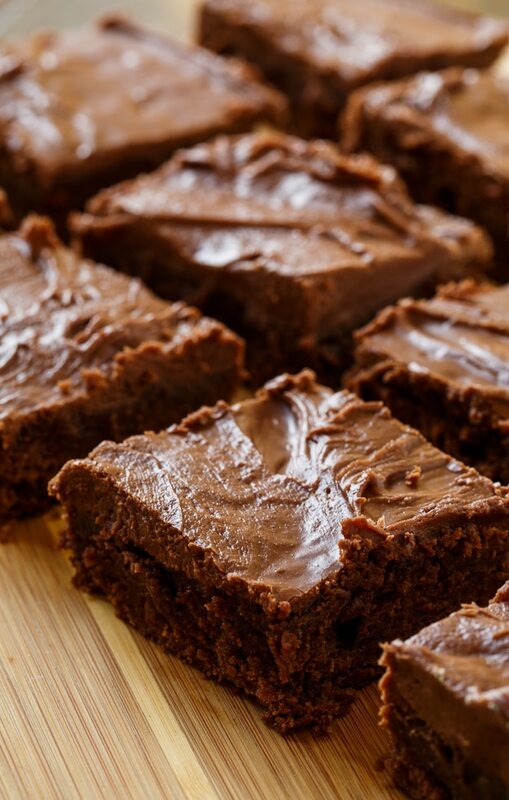 Supposedly this recipe was originally from a lunch lady in Idaho- hence the name Lunch Lady Brownies. The recipe dates back about 50 years, proving it has stood the test of time. It’s a simple recipe made from just butter, cocoa, flour, sugar, eggs, and vanilla. If you haven’t tried this recipe before, you’ll find they are definitely a keeper. 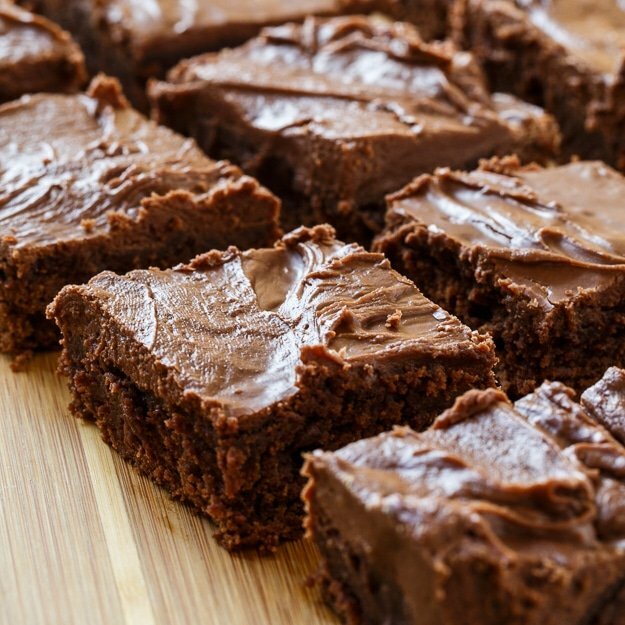 A classic recipe for fudge, chewy brownies with icing. Preheat oven to 350 degrees and line a 9x13-inch baking pan with foil. Spray foil with non-stick cooking spray. In a large bowl, whisk melted butter and 1/2 cup cocoa powder together until smooth. Add remaining brownie ingredients and stir until evenly combined. To make frosting, use an electric mixer to beat together all frosting ingredients until smooth. 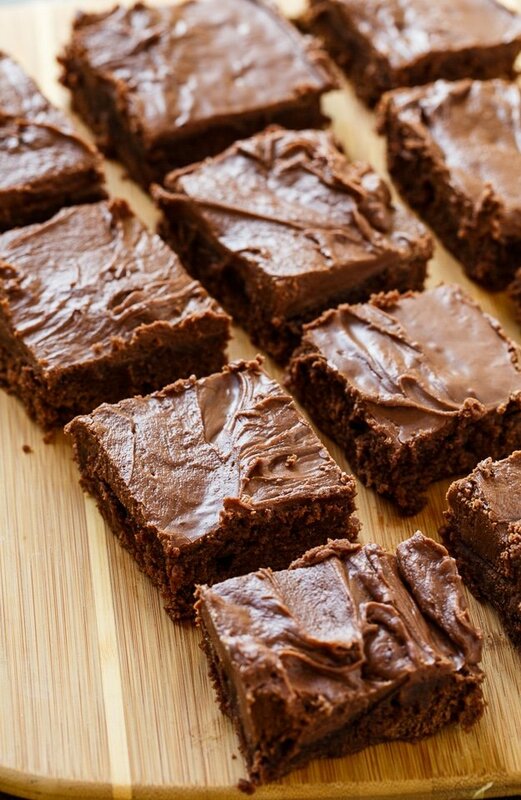 Spread frosting on brownies. This has become my favorite brownie recipe! I do not know what Patrice is talking about…must have screwed them up somehow…they are in fact delicious and I get rave reviews! I will NEVER make these brownies again. I know good food and these aren’t recommended. They’re bland, insulting to the lunch ladies everywhere, and cruel to kids. Do you use unsalted or salted butter? I’ve made them with unsalted and it seems like they are a bit lacking. Thought about trying a stick of each? Thoughts? 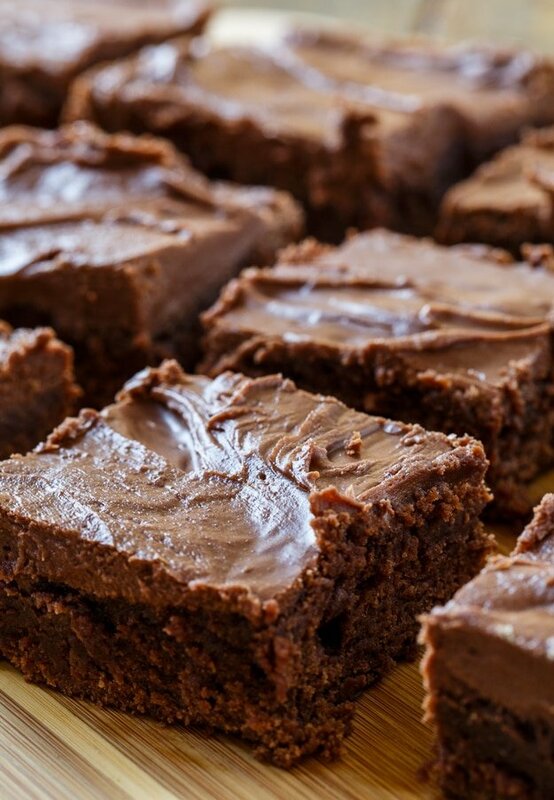 These brownies are easy and so delicious. So what did I do wrong? Mine turned out heavy and hard, kind of like hockey pucks! The version I had send was the same except it said to use softened butter not melted butter. I did use a mixer on low to mix them rather than stirring by hand and they didn’t appear done (using a toothpick) after the designated time so I left them in the oven an extra 5 min. I was so excited to find his recipe and so disappointed with the result. I think maybe you cooked them too long Ann. With brownies, I try to to never use a mixed. I stir with a spoon and try to not stir a lot. Brownies can be overmixed. The less you can , the better. Plus aluminum foil keeps the edges soft too. Good luck! Yes, I would eat five at least. Then the next day I would eat five more. Simply perfect brownies! 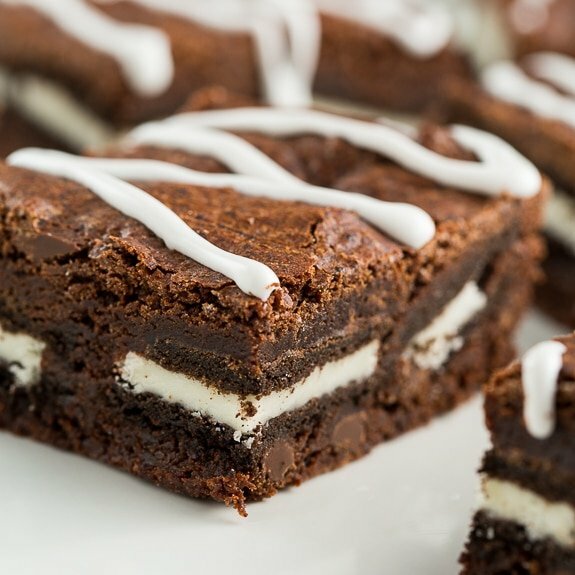 I’ve heard of lunch lady brownies, but I didn’t realize it was just with frosting…looks AMAZING! I wish I could reach through m y screen and grab five of these for breakfast! I have a huge weakness for brownies and these look just perfect! And yes to even more chocolate with that luscious frosting! I feel like I live under a rock sometimes…I haven’t heard of lunch lady brownies so thank you for introducing them to me. I haven’t yet met a brownie I didn’t like but these fudgy, chewy ones, with frosting, look amazing and has got to be an easy crowd favorite. I can see how it’d capture everyone’s imagination. 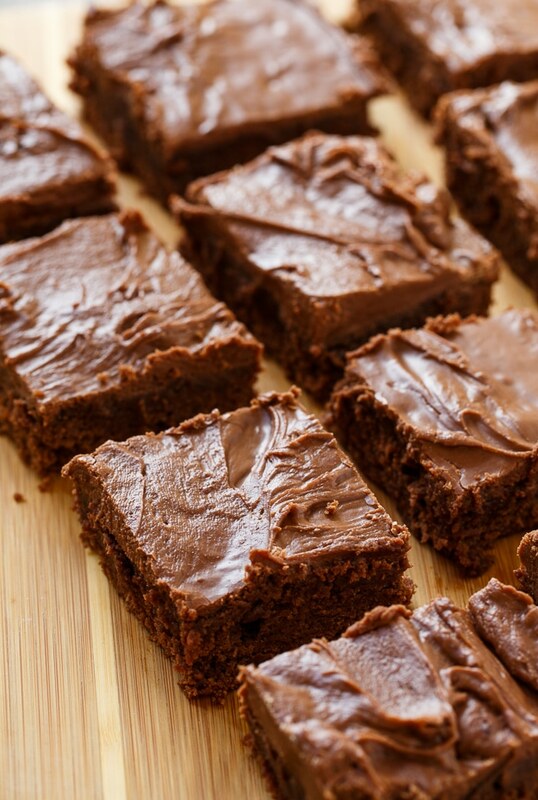 I wholeheartedly agree with you that the only thing better than a brownie is a brownie with frosting! These look PERFECT.